I like the idea, but it is sort of plain, nice shading though! Love the way the colors pop. Cool looking bike too! Good luck in the challenge. I like how the bike and the flowers are so bright compared to the background. The angle you shot this from is very nice. Good Work! beautiful soft tones... and everything else..
love it, makes me feel happy...love the color. What an amazing find for this challenge. 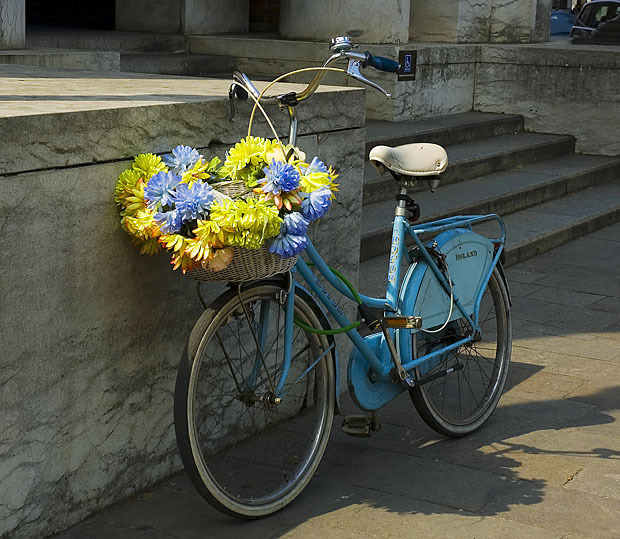 I love the matching flowers in the basket and the old fender extentions. What a classic shot in every way and one of my favorite entries of the challenge. Good luck! 10 from me. Proudly hosted by Sargasso Networks. Current Server Time: 04/19/2019 01:02:44 PM EDT.